The photo id for this photograph is 1333, in the Kettleshulme album. 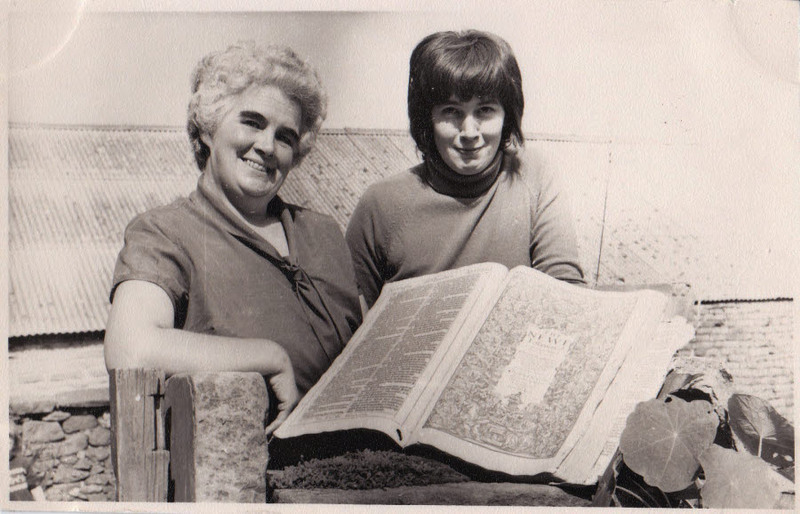 Picture Nora Warrington & daughter Dorothy with the Bible in 1962 taken outside Charles Head House. One of the most prized possessions of Charles Head is its Bible. A massive 6inch thick book the Bible was printed at London in 1611 by Robert Barker printer to the Kings most excellent Majesty. An inscription on the cover of the book reads. This Bible was given by John Ward at the Blue Boar to Edmond Pott at Charles Head for ever. It was his desire that great care should be taken of it and hoped it would make him to leave it so. The Bible passed from Edmond Pott into the hands of the Brocklehurst family But the donors request was never forgotten. Great care has indeed been taken of it and although the thick leather cover is tattered and worn from the use of many hands the book is still in almost perfect condition. I remember that story vividly. Great photo.